Download our free Dining Out e-book! 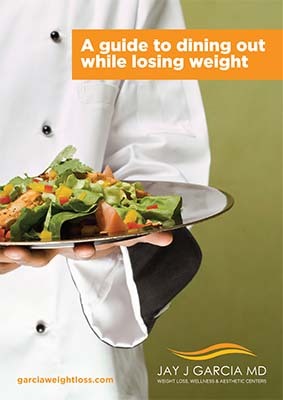 Eat at your favorite restaurants and still lose weight! Dining out while trying to stick to a diet can be confusing. Our free e-book will you help you avoid some of the most common mistakes and make any restaurant meal fit within your diet plan. Complete the form on this page to download your free copy now! The patient and any other person responsible for payment has a right to refuse to pay, cancel payment, or be reimbursed for payment for any other service, examination, or treatment that is performed as a result of and within 72 hours of responding to the advertisement for the free, discounted fee, or reduced fee service, examination or treatment. All Content © Copyright 2019 Everslim Centers LLC | All Rights Reserved | Photographs used on this site are not actual Garcia Weight Loss Patients unless otherwise noted. | As with any weight loss program, results cannot be guaranteed and your individual results will vary.